48 Hours In… Frankfurt am Main! While it is well and truly at the heart of Europe, in particular where trade and commerce is concerned, Frankfurt is also a spot you should consider for a long weekend, or a short mid-week break. It’s a young, vibrant city that’s diverse, traditional, exciting and modern in equal doses. Its history has left the city with many scars – in particular from World War II when vast swathes were destroyed or damaged, leaving Frankfurters to pick up the pieces and start all over again. In the ashes of it all, those scars of the dark times fuelled ingenuity, entrepreneurship and brought a new life to the city. ‘Guest Workers’ were brought into the city from the likes of Turkey, Greece, Spain and Italy to assist in the rebuilding of Frankfurt, many of whom remained and have created the foundations for the international epicentre we know today as Frankfurt am Main. When it comes to food – and you know us, we travel through our tastebuds – we were pleasantly surprised with that Frankfurt has to offer. 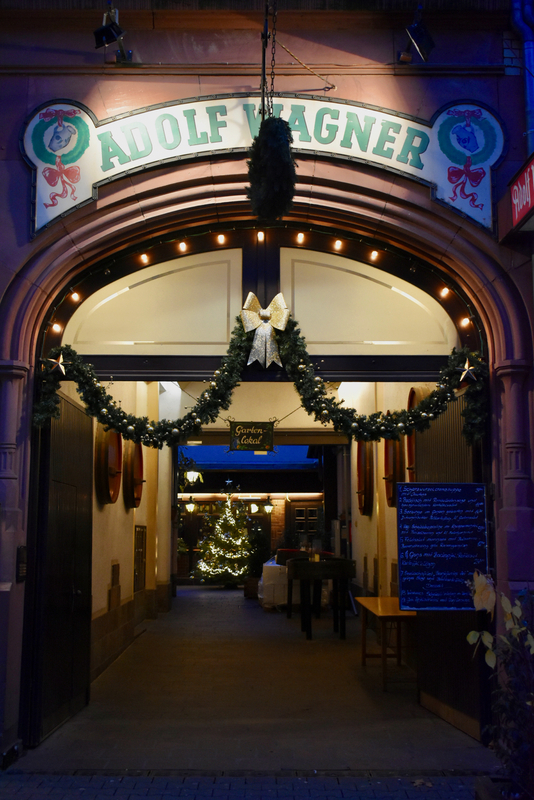 German Cuisine may not be well known around the world, save for the stereotypical dishes, but in a transport hub like this, a bit of tradition sprinkled with international flare makes this city a wonderful place to eat and drink, and a city worth getting to know! When we arrive in a brand new city, we always try to see if there’s something that we can do which gives us a good general overview of the place. Often it’s a bus tour but in the case of Frankfurt, it felt right to go up as high as we could and get an overview from there! The Main Tower, named after the River Main, is 56 storeys tall and gives you a breathtaking 360º view of the city. From the industrial sprawl on one end, to the quaint, traditional on the other, it’s the best way to give a sense of scale after you’ve just landed. Try to time it with sunset, as it’s especially gorgeous when the sun goes down! Entry to the tower costs €7.50 per person and there’s a fast lift to the level below the main platform (which has a near 360-degree view of the city), while ascending a few flights of stairs is required to reach the roof platform itself. 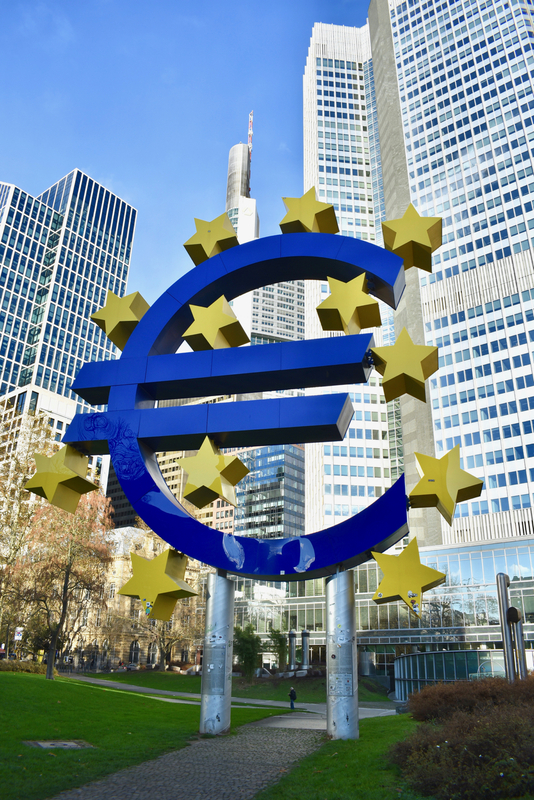 A symbol of the Eurozone and the currency used by so many EU countries, the Euro-Skulptur was unveiled in the 1990s at Willy-Brandt-Platz having been designed by German artist Ottmar Hörl. Originally positioned at the headquarters of the European Central Bank (until they moved to the outskirts of the city a couple of years ago), many people think this is an ugly, unnecessary work of art. In a Frankfurt where displays of flags or nationality are scarce, it’s a beacon of the European identity and countries working together. If you’re using your time wisely in between eating, there’s an array of museums within the city. For a more general look at the history and foundations of Frankfurt, the Historical Museum is open every day, with late night opening on Wednesday. Art fans adore the internationally renowned Städel Museum, while literature lovers flock to Goethe House and Goethe Museum, where the German writer, who we’d say would be the Saxon Shakespeare, is celebrated. For a speedy breakfast of well-made coffee, pastries and small sandwiches, head to Brot und Seine Freunde (Bread and His Friends) on Kornmarkt. Another great option is Cafe Karin, right around the corner which offers a more expansive breakfast menu. We adored Maxie Eisen on Münchener Straße, a bar and restaurant specialising in Jewish cuisine classics where we chomped down on excellent Reubens and pastrami on rye. It’s owned by popular local restaurateurs the Ardinast brothers (who also operate high-end bistro Stanley Diamond) and the kitchen serves almost ’til midnight daily whilst the bar keeps rocking ’til 2am on weekends. Take-out also available. We didn’t get to try Ebert’s Suppenstube, but we’ve heard great things about this little lunchtime spot on Große Bockenheimer. 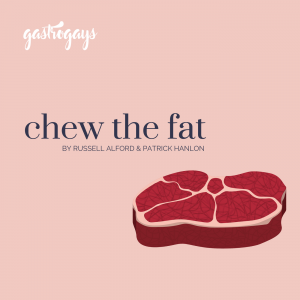 A celebrated local butcher and deli business, this is their cafe offshoot and specialises in fresh soups, comfort dishes and grab-and-go bites. 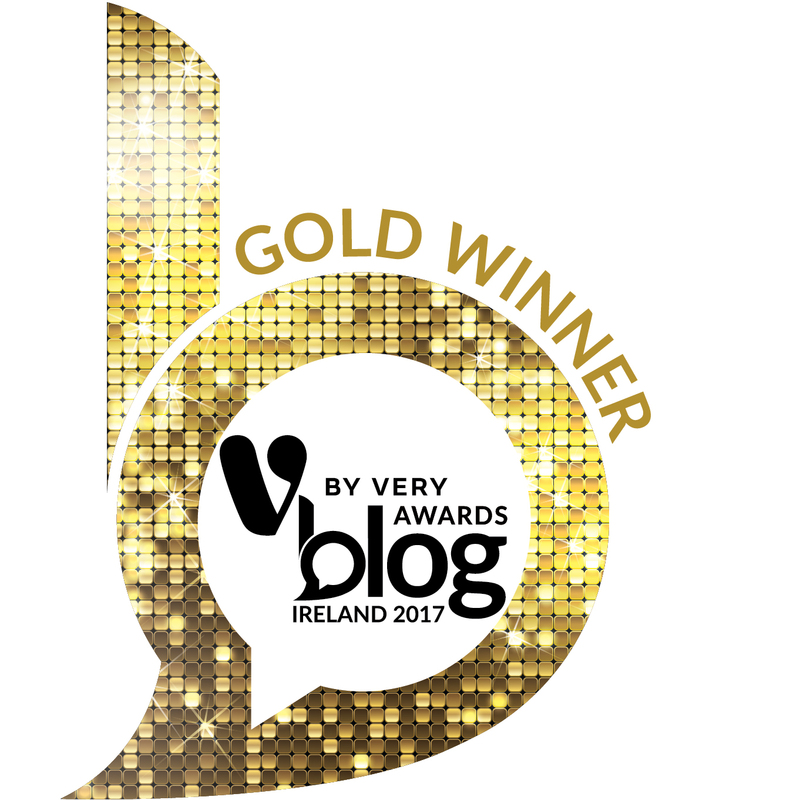 Well worth seeking out, we’re assured! 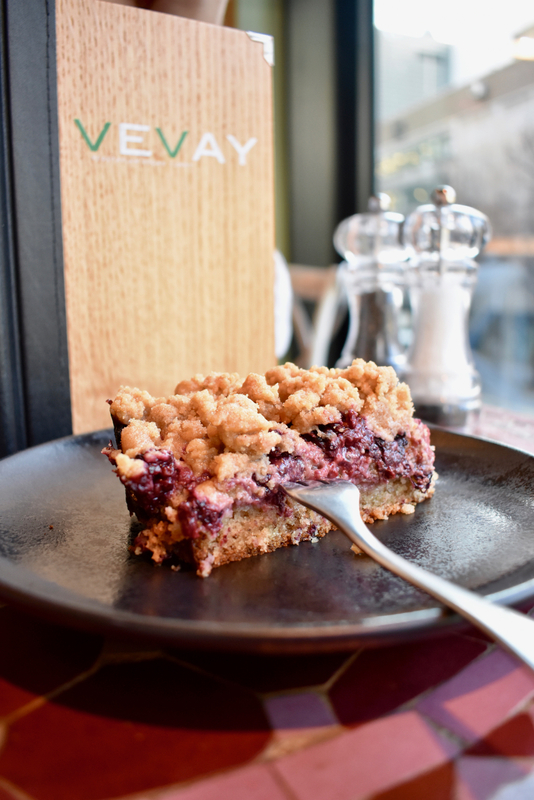 Or, for something more wholesome, healthy and plant-based, try vegan cafe Vevay. 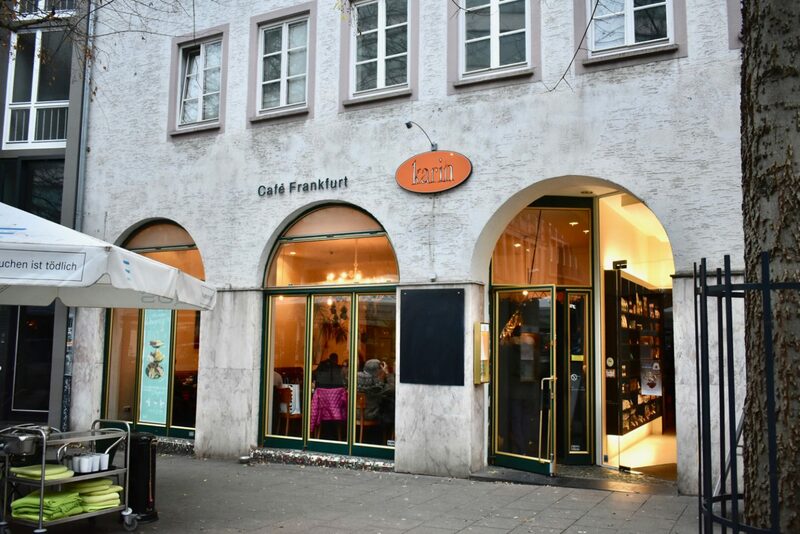 Set just off Willy Brandt-Platz (across from the iconic Euro-Skulptur) this neat little cafe has imaginative vegan and vegetarian dishes, energising juices and drool-worthy desserts – check out the cake display and try to resist! Open very unusually ’til 11pm Monday to Saturday, ascend the little spiral staircase and sit upstairs for a view across the plaza. 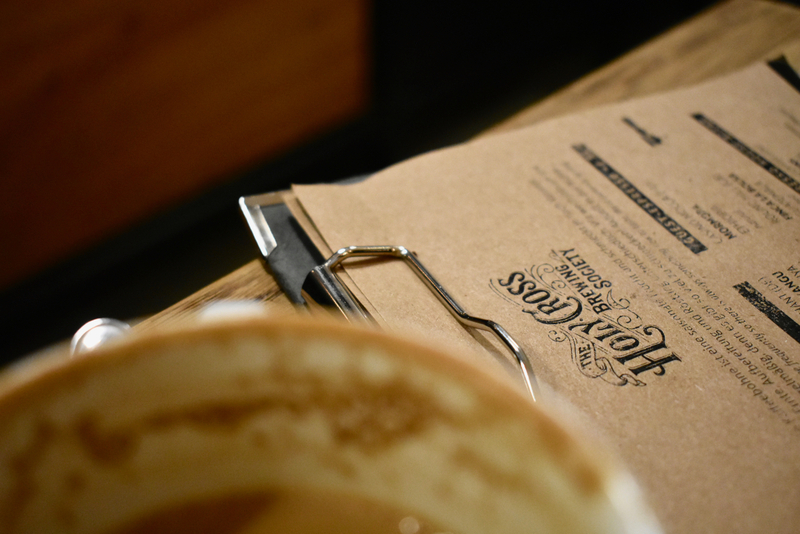 Who knew Frankfurt held within such an incredible coffee scene? Packed full of third wave coffee spots (yes, lots of free WiFi, infused water and comfy seating in abundance!) 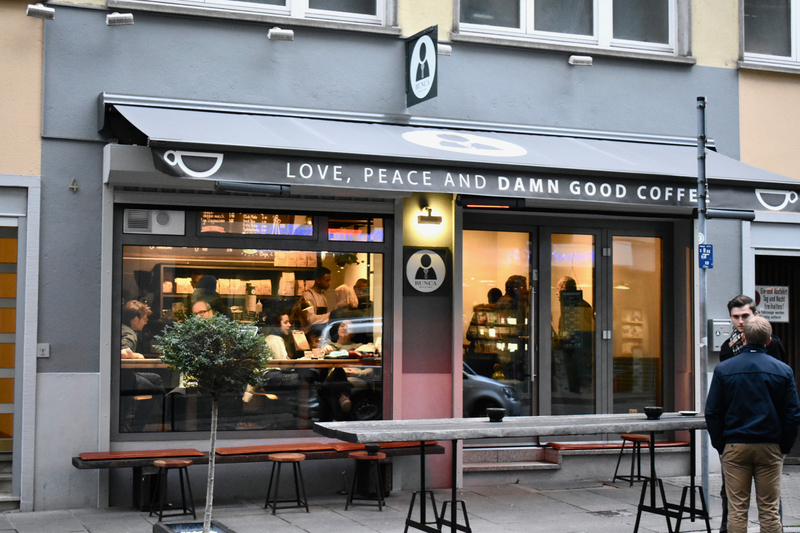 who take roasting and brewing incredibly seriously – just another example of how Frankfurt has shaken off its outdated reputation as a soulless commercial centre. 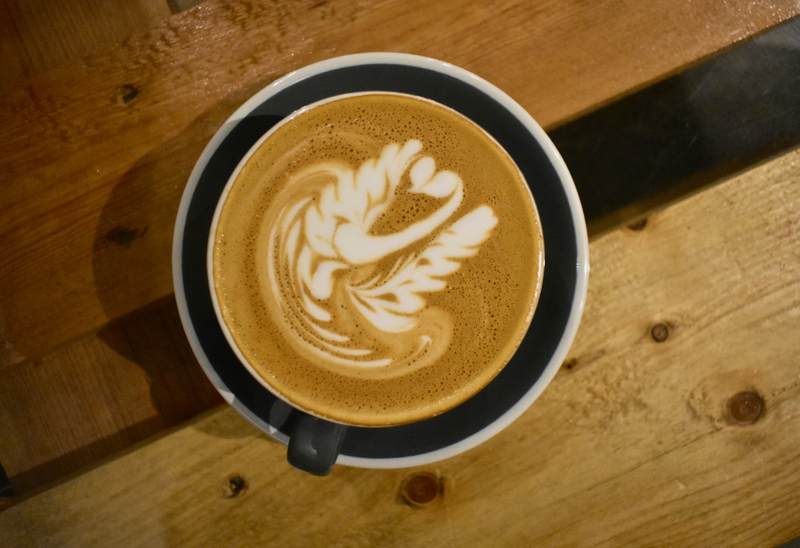 We’ve written an entire post on the coffee scene alone in Frankfurt, so click through to read our Guide to Coffee in Frankfurt. 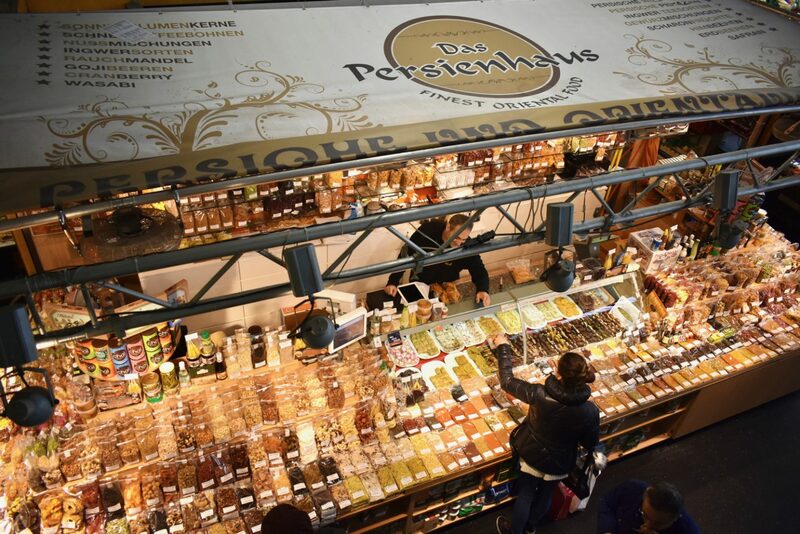 Still standing today is an old beacon of the city, the Kleinmarkthalle food market where so many locals still buy everything from exotic delicacies to daily provisions. It might look like a bit of an outdated eyesore, but inside is truly a treasure trove of things and an electric energy. This has been the location of a market for hundreds of years in Frankfurt, but like so many other structures it was flattened and obliterated in the Second World War. Painful reconstruction in the mid-Fifties ensued and today you still find that same structure, untouched really. 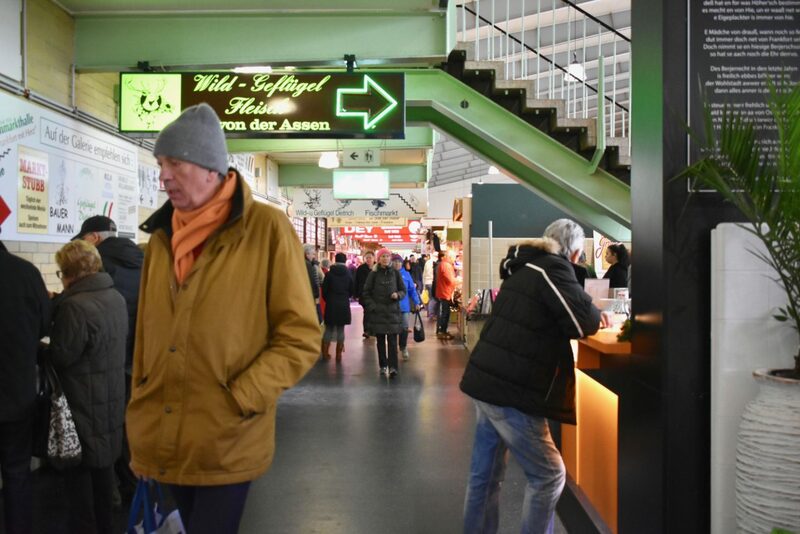 We had a fascinating food tour with Frankfurt guide Verena Röse who told us all about the history of the building, its traders and introduced us to some of its most iconic traders, from some of the oldest to some of the new generation. Meanwhile, we sampled so many amazing things from local charcuterie, flower petal-pressed cheeses and German wines to Greek sweets, Italian bites and of course bratwurst with Grie Soß (green sauce). 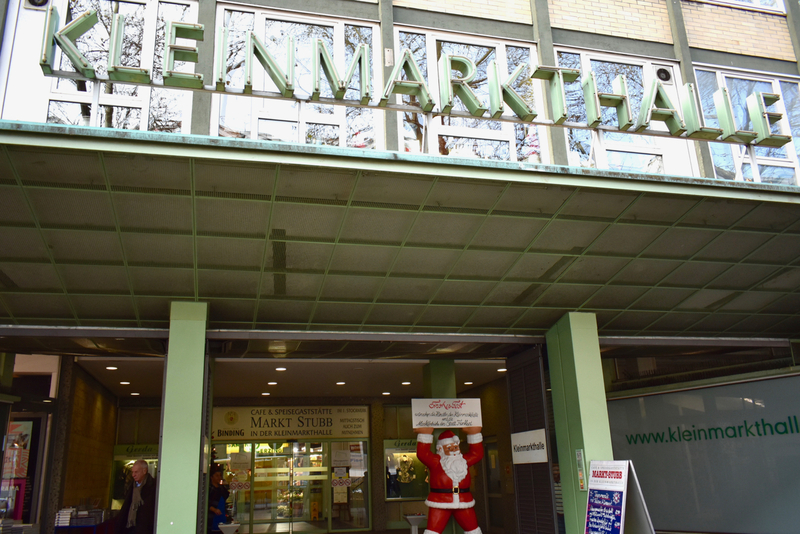 We’re writing up a post on Verena’s tour of the market, which we’ll share here soon! Good Food Lokalbahnhof was high on the list of places we wanted to try in Frankfurt. With our ’48 Hours In…’ style of travelling, we often have to be a tad choosy about where we want to go to fit everything into two or three long days. We wanted traditional, local cuisine, that was affordable but also in a setting that’s on the hipster end of the scale. Good Food Lokalbahnhof was it. Now the name is confusing because a lot of people on our social media assumed this was railway station. Because it’s the name of the nearest major railway station. Confusing, but this restaurant is named after the area, so it shares its moniker with that of the station. But trust us, this is worth finding. The menus are printed on large newspapers, held together on sticks, while a mix of rap and R’n’B pumps out on the speakers. When it comes to food, schnitzel is the name of the game. 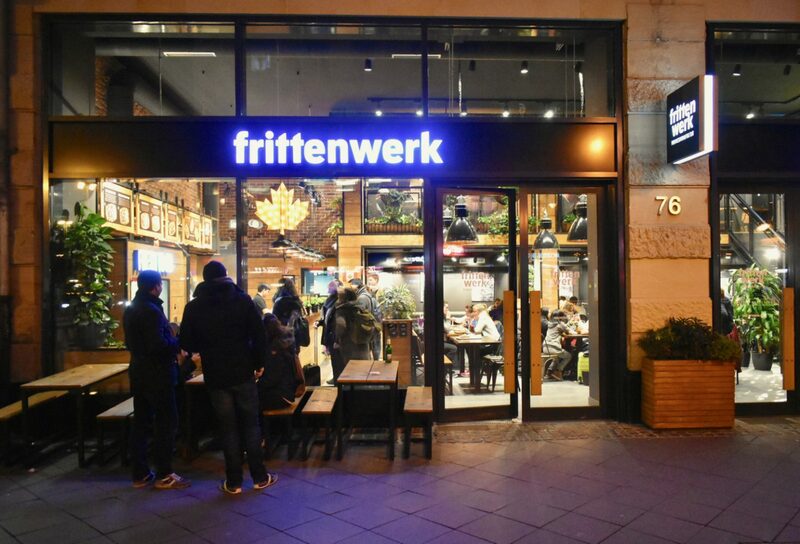 Large slabs of turkey meat, flattened, breaded and fried come served with either french fries or their pan-fried potatoes (opt for these…), as well as the iconic Grie Soß (green sauce), which Frankfurt is famed for. There’s a great little bar here too which has a wide range of wines, spirits and beers, from local crafts to big international breweries. Brunch is served here on the weekends for about €15 per person excluding drinks, and we’ve heard it’s well worth the visit (reservations are available). During the week, lunch is served 11:30am to 3pm, and costs €6.90. Handy and especially cheap if you’re in the area. 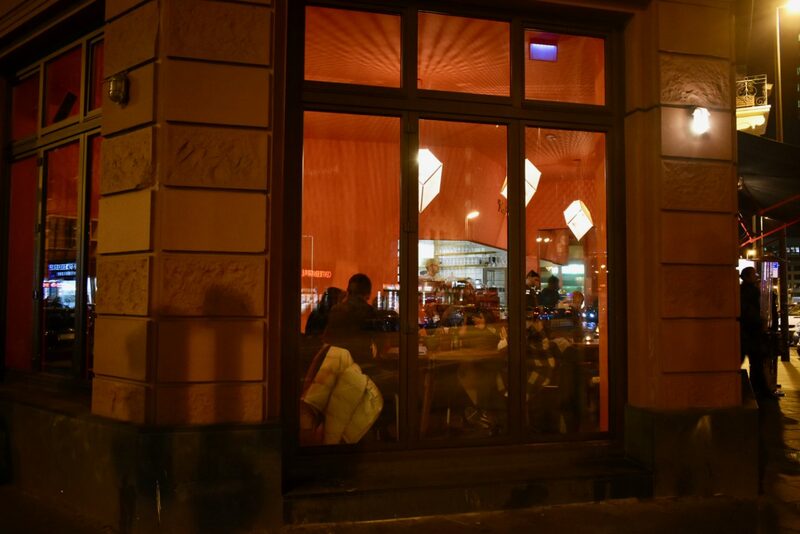 If you’re looking for destination dining in the middle of Frankfurt, Margarete is your woman. But: be prepared to queue on evenings or weekends. Serving from breakfast and mid-morning coffee right through to late night bites, this trendy, ultra popular urban dining room has space for over 200 between indoor and out. Dinner gets in to full swing from 6pm daily (three courses will set you back around €40 per person) whilst on weekends there’s a lavish buffet brunch – like you find in most of the continental European countries. Looking for fine dining in Frankfurt? Seven Swans is one of the newest Michelin star-awarded restaurants in the city, located on Mainkai right by the Alte Brücke. Serving seasonal set menus that truly celebrate local produce, it’s one of those fancy places where the dishes are merely stated as three ingredients and you’ll find something even more interesting – no meat. 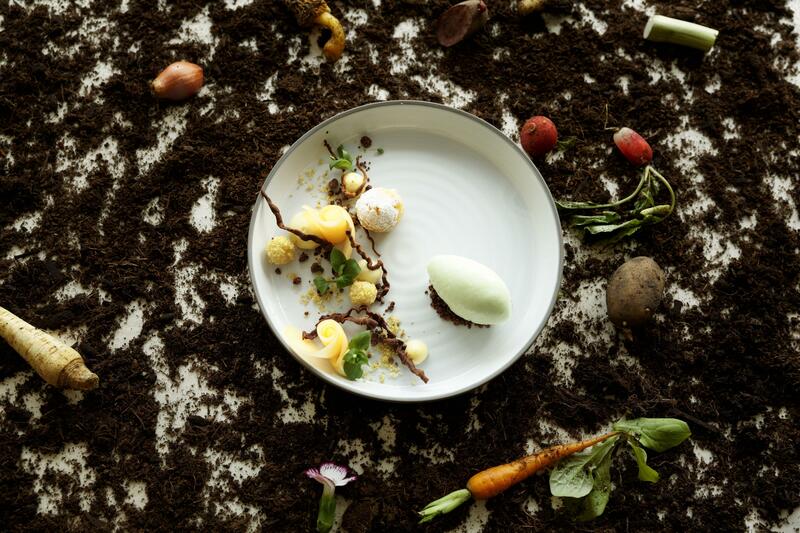 This is a vegetarian Michelin-starred, fine-dining restaurant. Small, unassuming and cosy as it might be, most of the produce is sourced from an expansive allotment just outside the city that the chef team tend to year-round. The beauty and bounty of nature is at the heart of Seven Swans. other Michelin starred restaurants in Frankfurt am Main include Gustav, Weinsinn and Restaurant Villa Merton. Lafleur has also been awarded two stars in recent years. We haven’t tried any of the above just yet. For a sensational supper club experience, stop by Club Michel. There’s few details on their website, merely a booking form but their Facebook and newsletter have more information. If you’re visiting in the lead up to the festive season, you’re in luck. 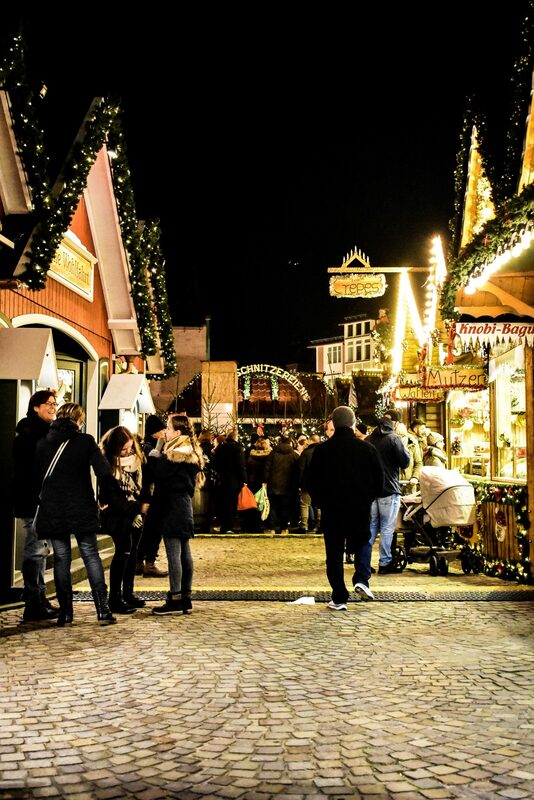 Similar to those in many German cities, Frankfurt’s Christmas Markets – yes, plural – are among the best in the country, if not Europe entirely, and so worth seeing and exploring. With market traditions dating back to 1393, it’s among the oldest in Europe too. Click here to read our full piece about the markets in Frankfurt and Wiesbaden. 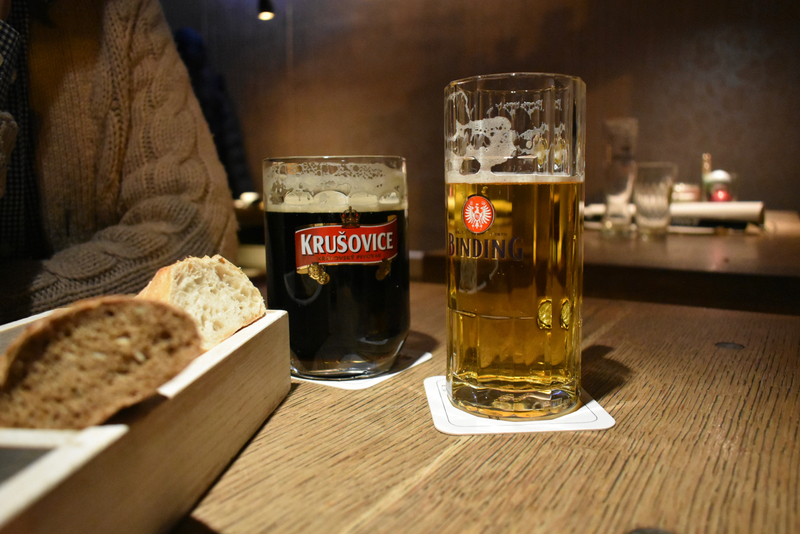 A contemporary beer hall with slick interior styling, Naïv is a watering hole you won’t want to miss. Stocked with a fine selection of craft beers, an impressive central bar commands the room, flanked by modern Scandi-style stools and a surround feature wine bottle holder, suitably filled, along with a seemingly endless line-up of spirits like an army squadron standing to attention, each one in formation. The 6,000+ wooden blocks are quite the feature of this place, and each one was hand-glued to the wall – now that’s aesthetic dedication! 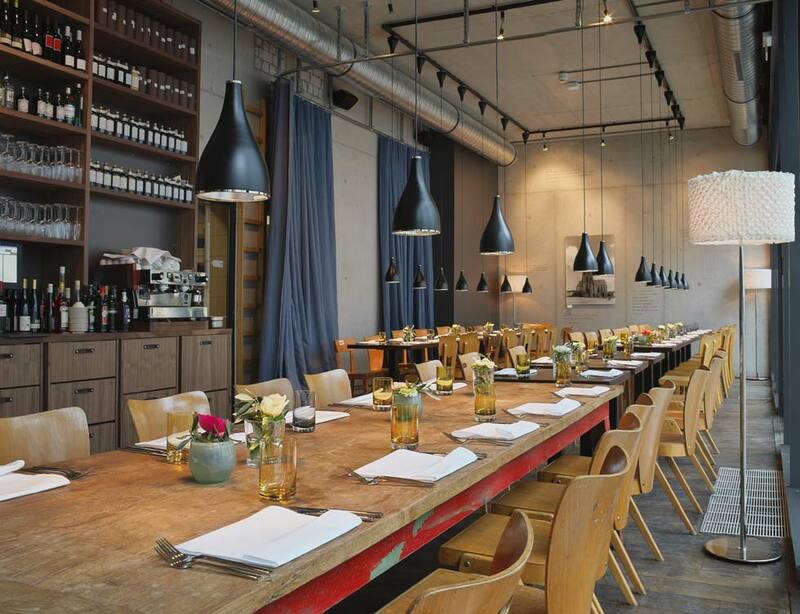 For food, the menu is simple, hearty and wholesome whilst seating consists of a number of long communal tables. If you’re looking for somewhere trendy to try a few brilliant beers you’ve yet to taste alongside a plate of something filling, this is where you want. Cocktail aficionados will love Sullivan. Its interior is Art Deco meets oriental with a long, somewhat narrow room appointed with an equally long bar, stocked with ample spirits running the gamut from classics to rarities, propped by lots of bar seating. There are smaller tables too, but enough about the interior, it’s cocktails we’re talking about here. The cocktail list features imaginative libations with some catchy names but the best bit is each one is earmarked with symbols indicating the flavour of the drink, from herbal to creamy, bitter to fruity. 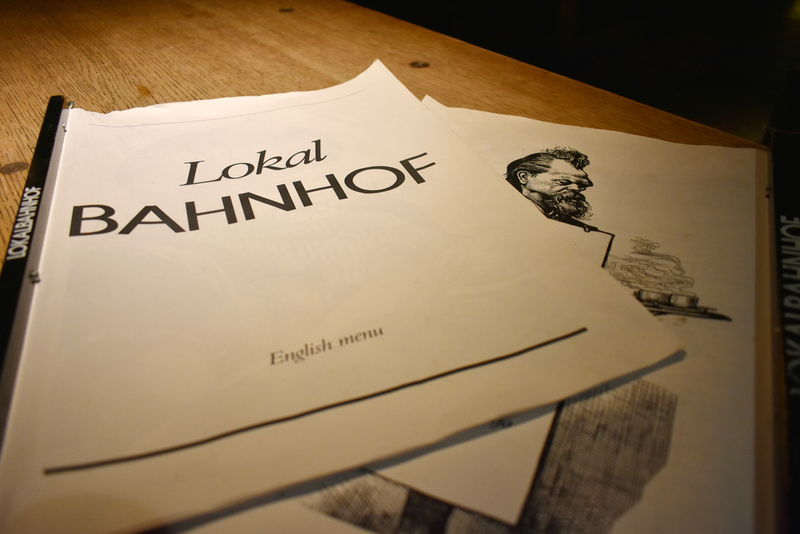 Set right within the heart of the city is Cafe Hauptwache, a grand cafe of epic proportion. Popular among locals and visitors alike. With it’s location in the heart of the shopping district, it’s the perfect spot to take some time out. 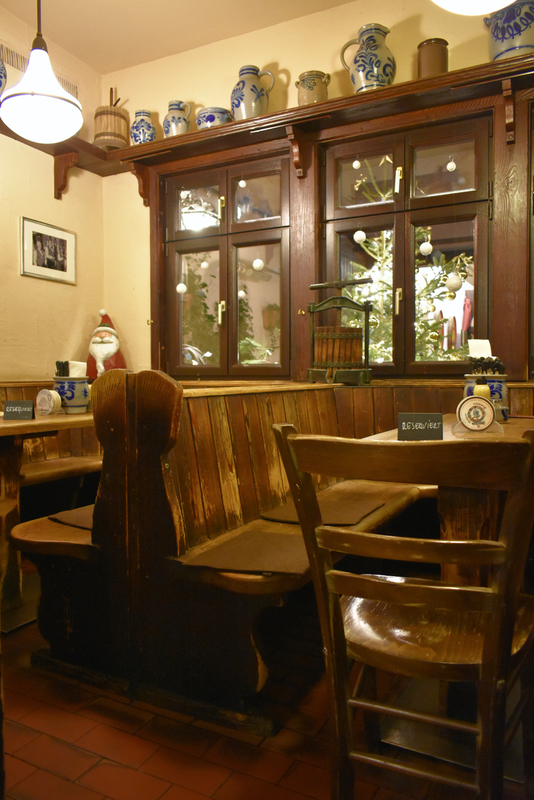 Down in Sachsenhausen, you’ll find a traditional olde worlde tavern dating back to the 1930s called Apfelwein Wagner. 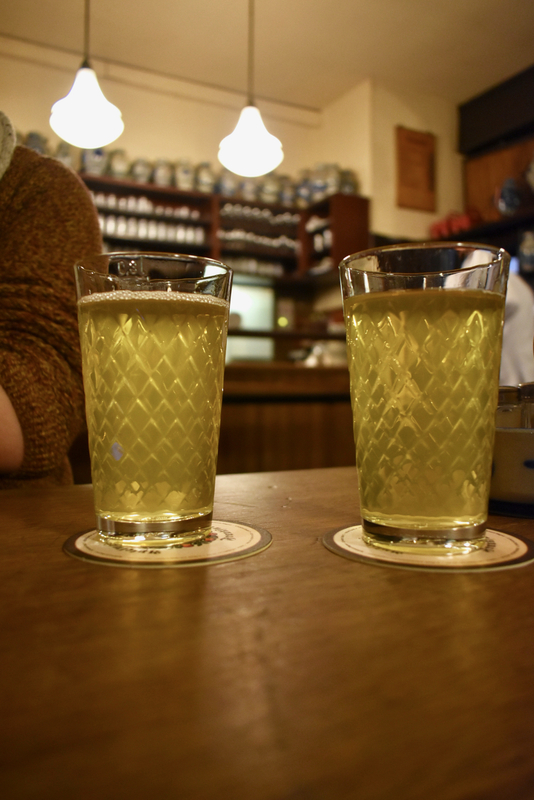 Apfelwein (apple wine) is basically just cider to you and us in the UK/Ireland, a sweet or sharp-tasting alcohol made from apples. 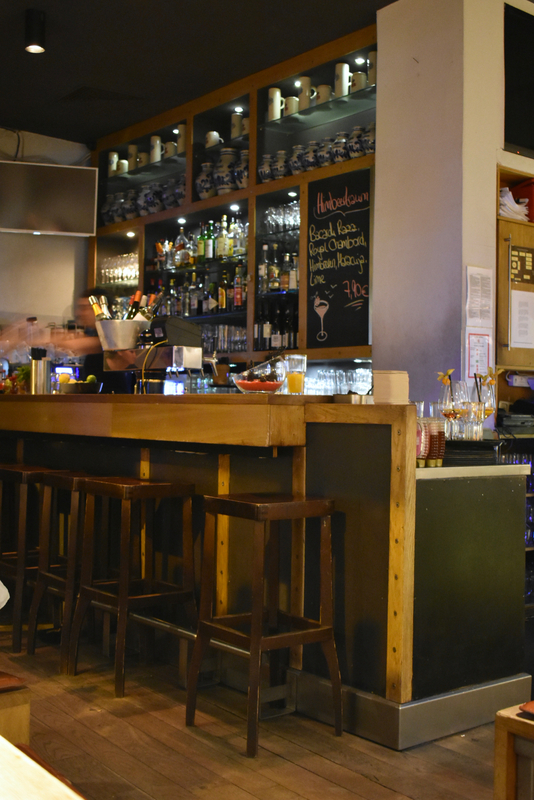 In Frankfurt, you’ll find lots of bars specialising in this, especially around the south of the city centre at Sachsenhausen. The one you need to try is Wagner, with its curtained entrance, large wooden communal tables and servers and waiting staff that feel like they’ve been part of the furniture for decades. A mix of loyal locals and intrepid tourists, stop by here for a ‘schoppen’ (glass of cider) or two. Both Good Food Lokalbahnhof and Plank also serve great drinks late into the evening, if you wanted to spend your time in either drinking rather than eating..or both. You can’t miss Montana Pizzeria on Weserstraße, with its big, bold ‘Free Parking, Free Coffee, Freedom’ neon sign brightly broadcasting its position. Once inside, it’s not the staff who will offer you a friendly smile (well, they might) but it’s the bright yellow pizza oven which is painted like Pac-Man. Famed for their take on traditional Neapolitan pizza, there’s a small menu and barely but a few seats however the crowds seem to happily spill out onto the street. There’s always queues at this pizza hut, and it stays open most night ’til 10 or 11pm, so if you’ve missed dinner or you’re heading home after a few drinks, this will sate you suitably. You can’t keep two Irish guys away from fries, so we made sure Frittenwerk was tried! 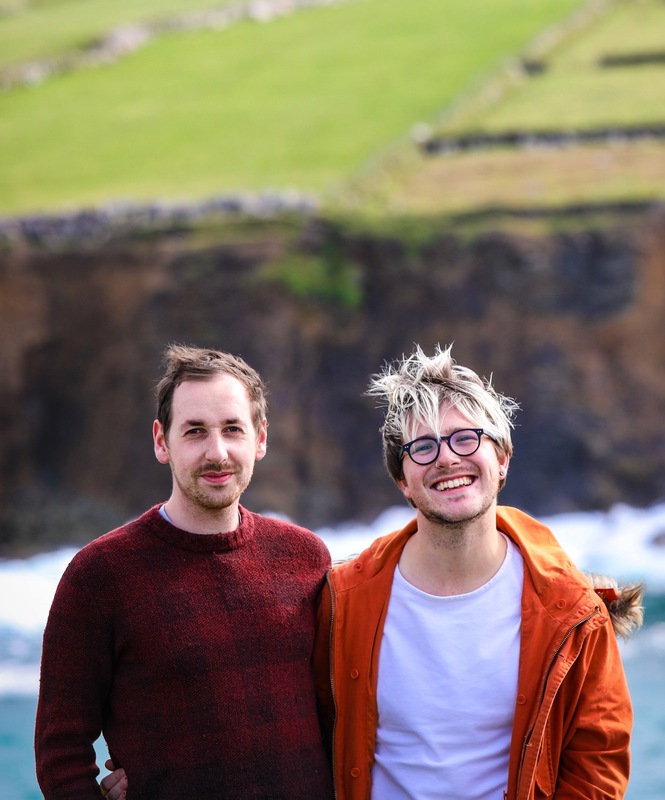 Our blogger friend Babaduck – who travels around Europe as a food and beverage buyer for airline clients, dreamy! – alerted us to this chip heaven’s presence and thankfully it was incredibly close to our hotel and within earshot of Frankfurt Hbf, so we challenged time and made a beeline here before catching our flight. 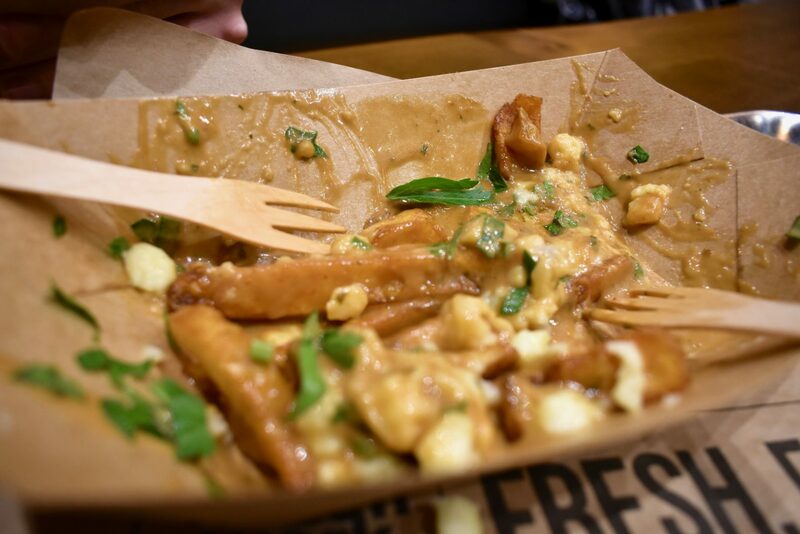 We love proper Canadian poutine and this place specialises in that heavenly mix of French fries (chips, to you and us), gravy and cheese curds, so we had to sample their classic Quebec-style poutine, and it didn’t disappoint one bit! 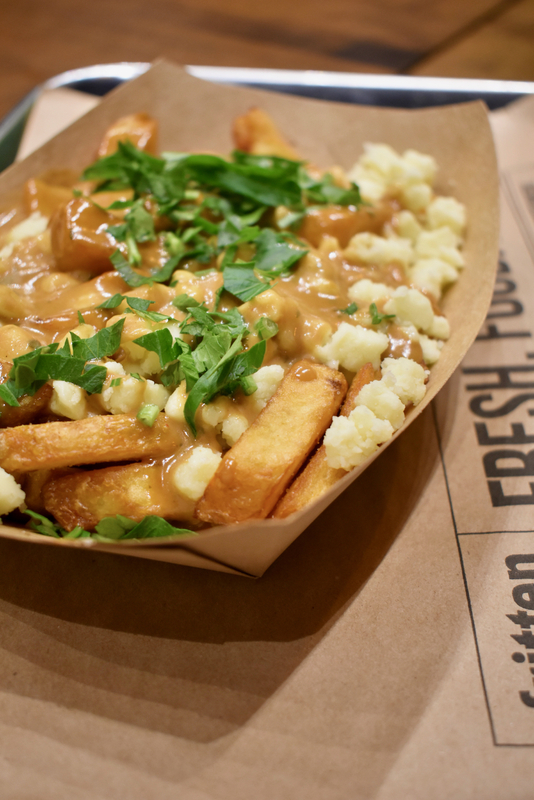 It’s all about the gravy, which brings everything together, but the cheese curds are so moreish and the chips are so good we could definitely justify happily chomping on them completely plain, but you have a wide menu of toppings and additions! There’s also branches in Dusseldorf, Essen, Köln and Aachen. Frankfurt is one of those cities that catches people off-guard when booking flights. There are two airports: Frankfurt Airport and Frankfurt-Hahn Airport. The former is the one you’d be likely to fly into if travelling with the likes of Lufthansa, the flag-carrier whose base the airport is, along with other national carriers like Aer Lingus, British Airways etc. Though budget carriers like Ryanair do fly into the main airport, themselves and Wizz Air fly have traditionally almost exclusively stuck to Frankfurt-Hahn. Details on how to get to and from Frankfurt-Hahn airport can be found on the airports website. For passengers arriving into Frankfurt Airport, it’s a fairly straight forward transfer. Follow the “To Frankfurt” signs to the mainline station within the airport, from there frequent services will take you less than 20 minutes into the city centre. It’s incredibly fast, efficient and cheap. 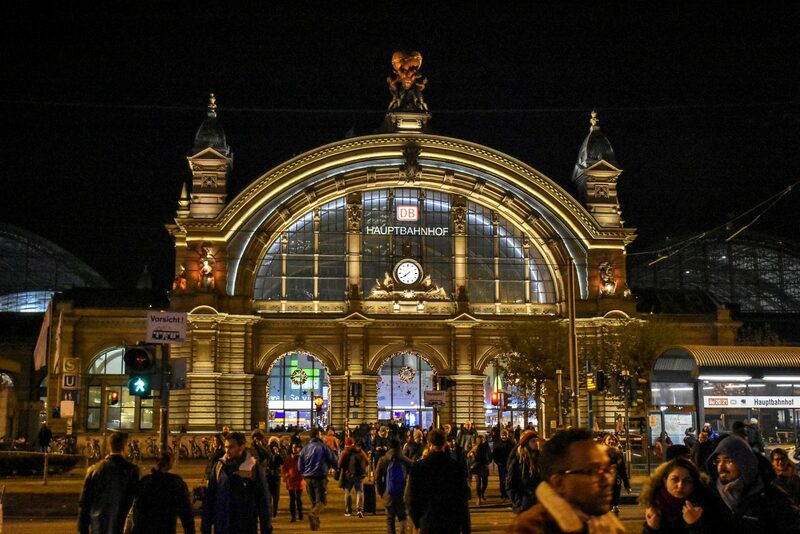 The central train station is Frankfurt (Main) Hauptbahnhof, abbreviated to Hbf (it’s the German for main train station). Something to bear in mind too is that the the river in the city is called ‘Main’, which to English speakers can be a tad confusing! As you’d expect, the train is on the U-Bahn lines 4 and 5, several tram lines and also within walking distance of a quite a popular area. However, it might be more convenient to alight at Frankfurt Hauptwache, depending on where you are staying. Train tickets cost €4.65 for an adult single. 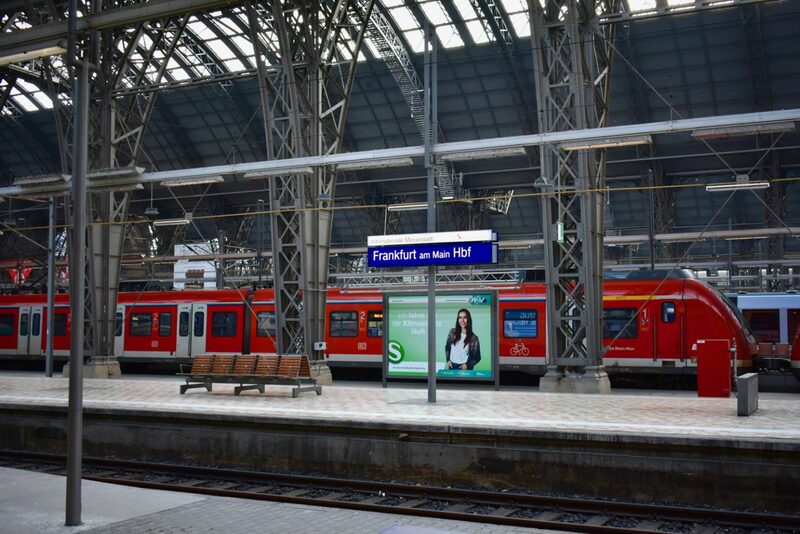 For travelling to and from Frankfurt by rail, ICE (Intercity Express) services connect the city with Berlin, Munich, Bern, Brussels, Amsterdam, Paris and many more. 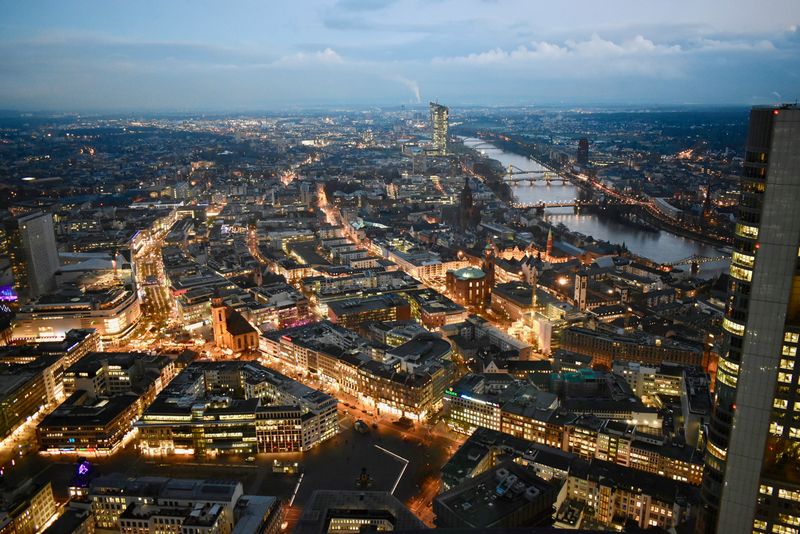 Frankfurt, being quite a flat city, is very easy to walk around – like Dublin, Galway or Stockholm. Most attractions, restaurants and bars which we’ve come across were within a 25 minute walking radius of the city centre. The trams are frequent enough and all transport is easy to navigate and understand. 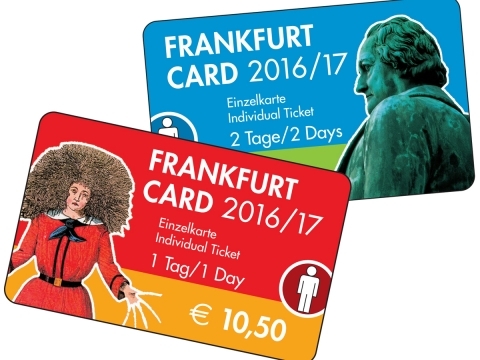 The Frankfurt Card is available with discounts to attractions, as well as the fare to and from the airport. There are no barriers at train stations or card readers on trams, but our tickets were checked on more than one occasion, unlike in other cities we’ve visited. For your convenience we’ve pasted above our map we compiled whilst researching and exploring the city. We love doing this as it’s a bit more of a visual guide to the city and also there’s places pinpointed on here we didn’t get to or didn’t have space or time to write about just yet. Enjoy the city, we’re looking forward to returning! Huge ‘Thank You!’ to the German National Tourist Board for organising and assisting us with this post.